Gluten-free pancakes that are light, fluffy and so full of flavor! 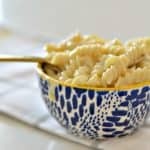 They are going to be a new family favorite recipe whether you eat gluten-free or not… They are THAT good! Plus, they can be made in only 20 minutes. 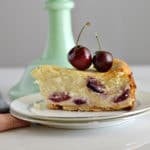 These yummy breakfast cakes first appeared in the cookbook my mom and I wrote together, Gluten-Free on a Budget, a few years back. Since then, we have had so many people tell us they have never had better pancakes. Truly an honor for us and so exciting to now share them here with all of you! 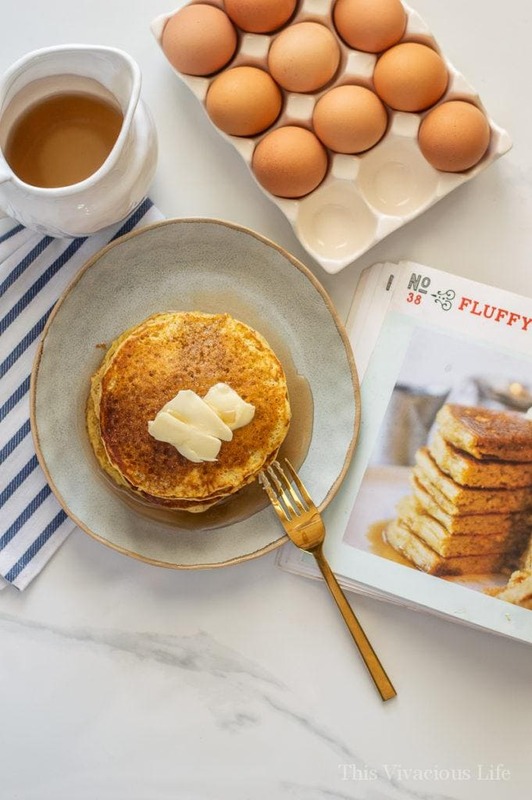 You are going to love how fluffy these hotcakes are! 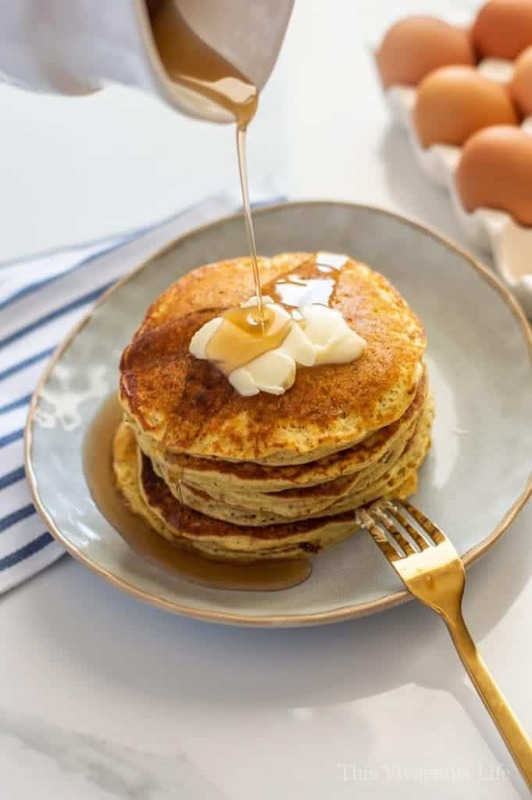 They are just sweet enough to enjoy with a pat of butter or perfect with more sweetness like you can find in our buttermilk syrup we usually use on our oatmeal pancakes. 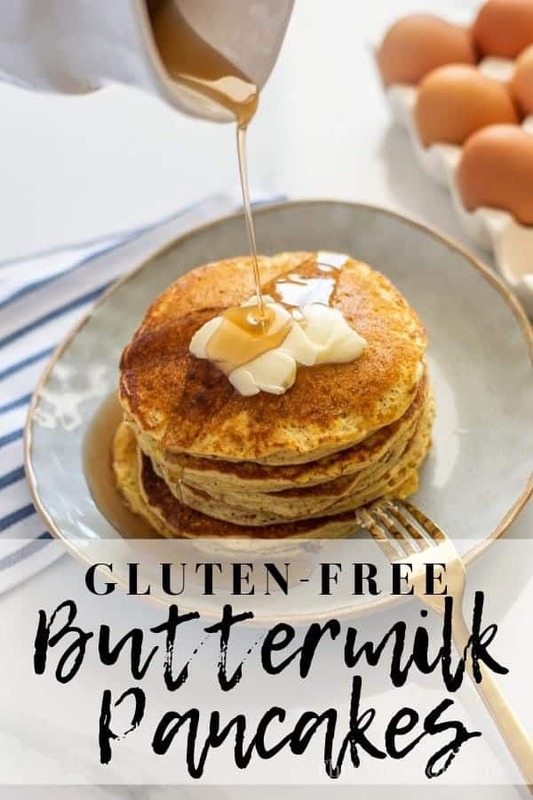 Ok so we do use a few different gluten-free flours to get the perfect taste and texture in these gluten-free pancakes. I don’t want it to seem overwhelming though. It really takes less than two minutes more than using one all-purpose gluten-free flour and the end result is SO much better. 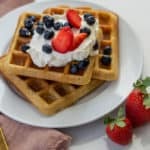 When you combine gluten-free flours in the proper proportions for each recipe, like we do in our gluten-free waffles or gluten-free cinnamon rolls, you get a truly incredible end product. 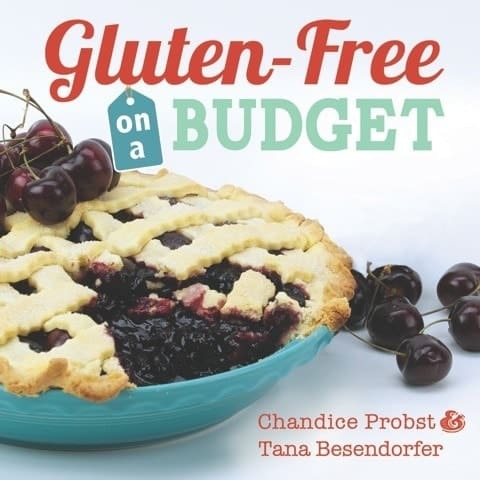 I buy individual flours and gluten-free baking products like brown rice flour, white rice flour, potato starch and xanthan gum on Amazon (you can find ALL our favorite gluten-free baking products HERE). I then store them separately in these airtight containers and label them. 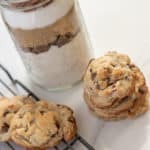 It is then so easy to just pull out the jars and measure and bake according to the recipe you are making. I always store nut and coconut flours as well as flax meal and chia, those with the most fat content, in the freezer to keep them as fresh as possible. Can you make this into gluten-free pancake mix? You can absolutely make this into gluten-free pancake mix and store it in airtight containers. 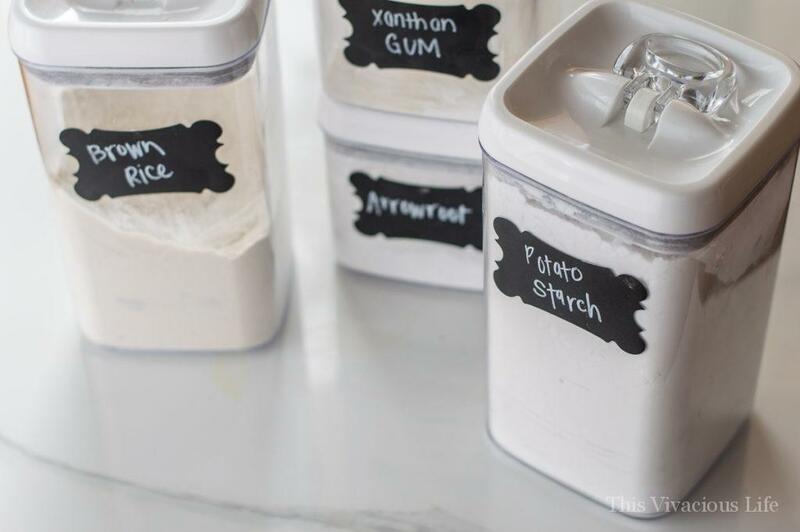 Simply combine all dry ingredients in an airtight container or mason jar and store at room temperature for up to 3 months on the shelf. If you would like to make and store them in gallon freezer bags, the mix will freeze for up to 1 year. You just need to pull it out of the fridge 30 minutes prior to assembling and you are good to go! 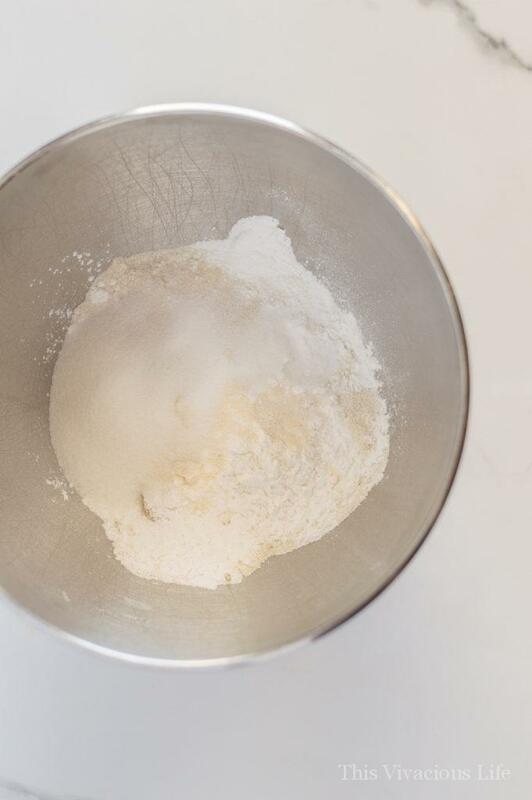 In a stand mixer, combine all dry ingredients and mix well. 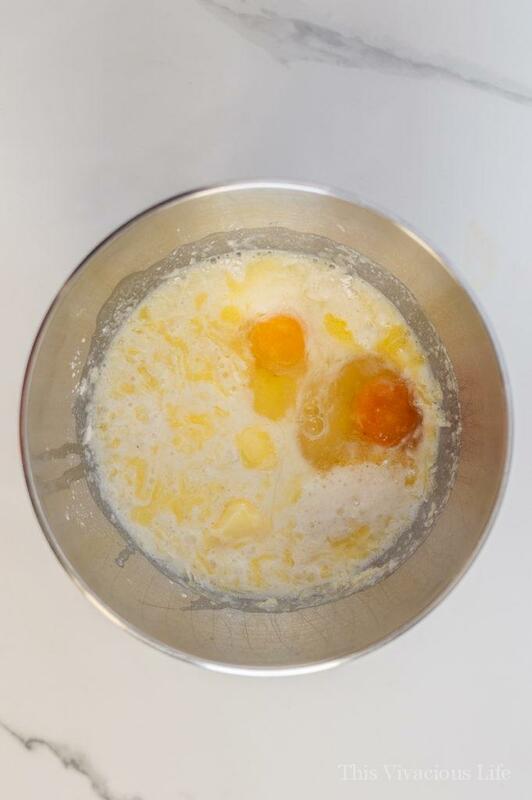 Add melted butter, buttermilk, milk, and whisk in eggs. A little more milk can be added if needed, but the batter should be fairly thick. Heat a skillet or griddle to medium/high heat. 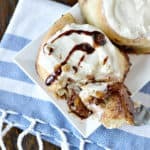 Using an ice cream scoop, scoop batter onto the hot griddle. 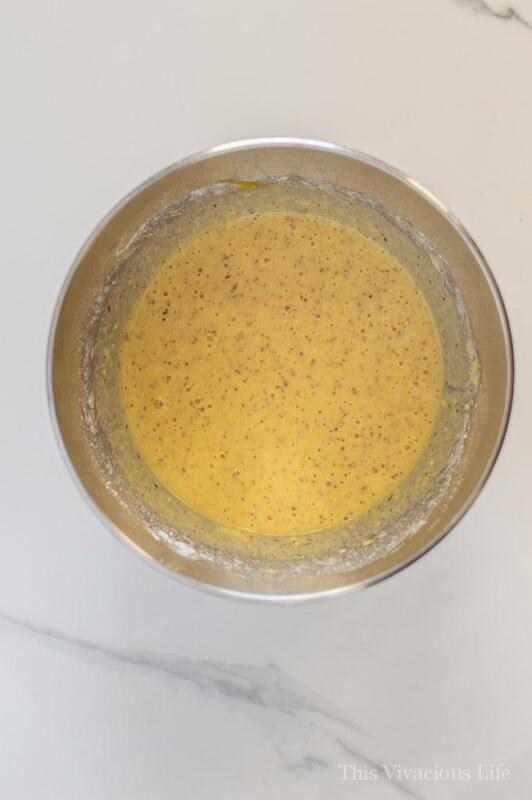 Use the back of the scoop to spread out the batter a little bit. Let the pancakes cook until the edges appear done and it is nicely browned. Flip the pancakes and cook on the other side. Avoid patting the pancake down or flipping it multiple times as this will decrease fluffiness. 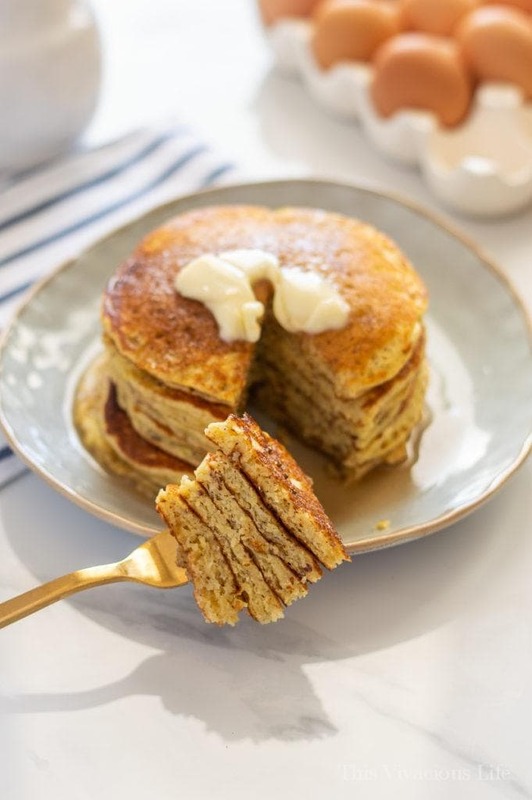 Can you make these gluten-free pancakes dairy-free? 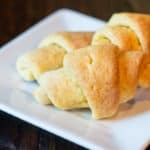 You can make these dairy-free by using a dairy-free butter alternative like Earth Balance sticks or coconut oil in place of butter. You will also need to replace the buttermilk with full-fat coconut milk and 1 T lemon juice. Use the coconut milk in place of the other 1/4 C milk as well if you need it to thin the batter out. I don’t recommend almond milk as it doesn’t have as much of the fat you will need to make these great. 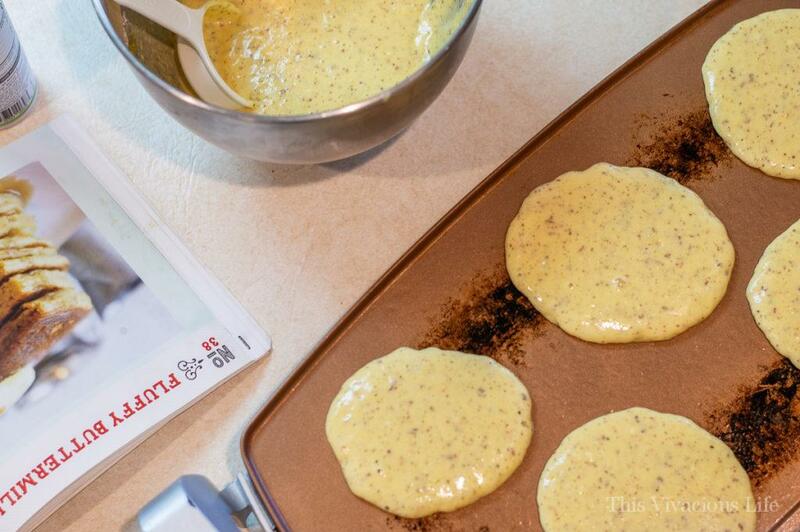 You can store made pancakes in an airtight container or ziploc bag for 2 days at room temperature. They will store for 3-4 days if you keep them in the refrigerator. Can gluten-free pancakes be frozen? 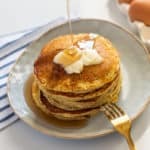 You can make up the pancakes, bring them to room temperature then store them in plastic freezer bags for up to 3 months. Simply open and remove the number of pancakes you want then heat them up in the microwave or in the toaster. 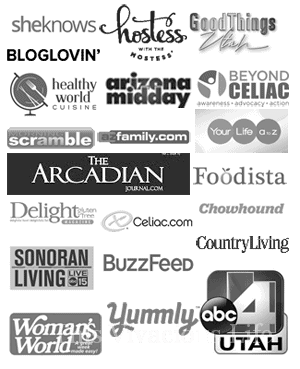 I buy individual flours and gluten-free baking products like brown rice flour, white rice flour, potato starch and xanthan gum on Amazon (you can find ALL our favorite gluten-free baking products HERE). I then store them separately in these airtight containers and label them. It is then so easy to just pull out the jars and measure and bake according to the recipe you are making. I always store nut and coconut flours as well as flax meal and chia, those with the most fat content, in the freezer to keep them as fresh as possible. You can absolutely make this into gluten-free pancake mix and store it in airtight containers. 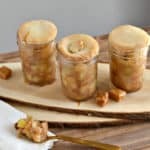 Simply combine all dry ingredients in an airtight container or mason jar and store at room temperature for up to 3 months on the shelf. If you would like to make and store them in gallon freezer bags, the mix will freeze for up to 1 year. You just need to pull it out of the fridge 30 minutes prior to assembling and you are good to go! 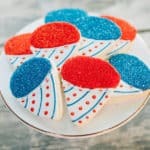 You can make these dairy-free by using a dairy-free butter alternative like Earth Balance sticks or coconut oil in place of butter. You will also need to replace the buttermilk with full-fat coconut milk and 1 T lemon juice. Use the coconut milk in place of the other 1/4 C milk as well if you need it to thin the batter out. I don’t recommend almond milk as it doesn’t have as much of the fat you will need to make these great.